Added moisture for optimal results. ​Improved roasting and baking: moisture ensures an incredibly light dough and a nicely browned crust. 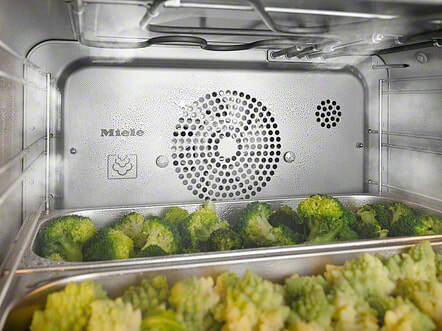 ​Success guaranteed: fast and even distribution of steam in the cabinet and around cooking containers. ​Scratch resistant: this special surface finish with its linen-weave pattern is very robust and easy to clean. ​Today's generation of cooks are open to new ideas and place great value on premium cookware and innovative kitchen technology. A speed oven, with its host of convenient features, is our "menu recommendation" for contemporary cooking.